A Sample of some of the Car Properties that SOLD with the help of a CarProperty.com AD (as reported by the advertiser) .. there are a lot more ADs that have been marked as sold that you'll find on the site. You asked about our use and success with CarProperty.com and I can tell you that we love that site. It has been very good for our business in the 1.5 years that we have been a regular and heavy advertiser on the site. We have over 50 classified ads running at any given time, plus we run ads in their email newsletter. We have also run banner advertisements with them, so we have pretty much used everything that they have to offer. We’re never 100% sure where our leads come from or where a buyer, that a different agent represents, found out about our properties, but I can say that we’ve had a lot of positive response to our advertisements on this site. We’re not at liberty to say anymore about the site, other than to say that we highly recommend it. "I showed houses today and stripped my deck for staining. Finally getting some houses sold.�I love this website and highly recommend it and the exclusive agent network." "Thanks again, I have already gotten a few calls after buying my Exclusive Agent Territories just 36 hours ago, have a good weekend". "Thanks Tom! I'm looking forward to great things. Thanks for dropping the price. I'm sure it will pay off". "When I was buying a house with a Garage Mahal, I used CarProperty.com on a regular basis until I found the one I wanted to purchase. In your spare time you should surf through their offerings if you want to see some magnificent properties with unbelieveable garages". "This is a great website. Keep up the good work"
"What a great way for us to find buyers who appreciate our 10 car garage ... we could not have done it without you"
"It made it really easy for me to satisfy my seller clients while targeting potential buyers who also wanted the mega garage this house had to offer .. we had a great offer from a buyer who came to us from our advertisement on your website"
"As a Commerical Real Estate Agent and Property Owner, I know how hard it is to target buyers and renters for our automotive properties and businesses in Auburn, CA ... CarProperty.com took care of that problem and it's even a fun website!" 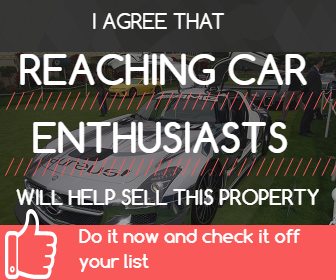 "We run a very fun and exciting Car Condo membership only facitility and we have plans to build more.� This website has really helped us because we can run individual property specific ads for each Car Condo we are selling"
"Our race track has a lot to offer racing fans and car enthusiasts that they would never had known about without a lot of advertising ... we love CarProperty.com because it is highly targeted at the same customers we are looking for and even the most expensive ads on the site are really affordable for the reach it gives us .. keep up the good work! If you want your quote considered for this page, please send and email to�customerservice@carproperty.com�and we might add you on this page.